It was a potato. 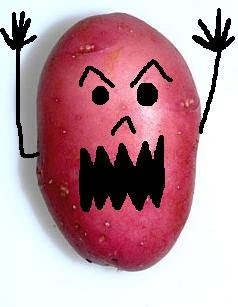 A mean, angry, merciless red spud that did me in. I will warn you that this particular story might be a little on the EWWW side, and I am sorry to share such horrible things with you, but I can't get through this alone. Let me just say up front, to eliminate any confusion later, I love potatoes. L-O-V-E them. Thanks to their consistent yumminess, mixed with their cheapness and ability to keep me full, they are a staple in my (often daily) diet. So. Last night, I wanted to make some cheese potatoes. (Boil some red potatoes, drain, butter, melt cheese slices on top, yum, trust.) While choosing my potatoes from the Potato Bowl, I noticed one of them had this (GROSS ALERT!) black, clustery gross thing happening on it. Me: EWWWWW! I think this one has eggs on it! Or is it just foaming? Mom: I think it's foam. She totally touched it! Blech! And lucky for her, it was foam, because y'all, what if it had been foamy EGGS?! GAG! Mom: It's fine. Just rinse it off. (Ok, keep in mind that my senses were all hypersensitive from being all grossed out from the foam and all, plus mom was still in egg mode.) I rinsed the potato and grabbed a towel to make sure the foam was all gone. As soon as I put even the slightest pressure on that spot on the potato to dry it, my finger breaks right through the potato into it's mushy rotten spot and white, starchy potato guts came shooting out at me. My response? Scream like a little girl, throw that potato, and RUN! My mom's response? Scream like a grown up and RUN! She took off down the hall, and after I recovered from my near fatal laughing hysteria, I found her hiding in my bedroom afflicted with the very same hysteria. Apparently she thought a critter of some kind jumped out at me in defense of the hypothetical eggs, while I just heard that awful popping noise of the exploding potato. Oh my gosh, it was just gross, although it's good to know where our Fight or Flight response stands. Flight all the way. Um...yeah....BUT....why did your mom take off in a DIFFERENT direction from YOU? I mean, no offense Mom...but...isn't she supposed to throw her body on top of yours or something?